A growing body of research in phonetics, phonology, and psycholinguistics suggests that human language sound patterns are influenced by the predictability of the higher level linguistic units they signify, e.g. words. The relevant context for computing predictability arguably takes into account all levels of linguistic representation in which the sound pattern is embedded. Relevant patterns have been observed at both the level of individual languages as well as cross-linguistically regarding, for example, preferred contexts and likely outcomes of a range of phonetic and phonological processes (see, e.g., Aylett & Turk 2004; Buz et al., in press; Cohen Priva 2012, 2105; Hall 2009; Hume & Bromberg 2005; Hume et al. 2013; Jurafsky 1996; Kleinschmidt & Jaeger 2015; Oh et al. 2015; Piantadosi et al. 2011; Seyfarth 2014; Shaw et al. 2014; van Son & Pols 2003; Wedel et al. 2013). The symposium brings together researchers investigating these and related issues from a wide-range of perspectives and formal approaches. 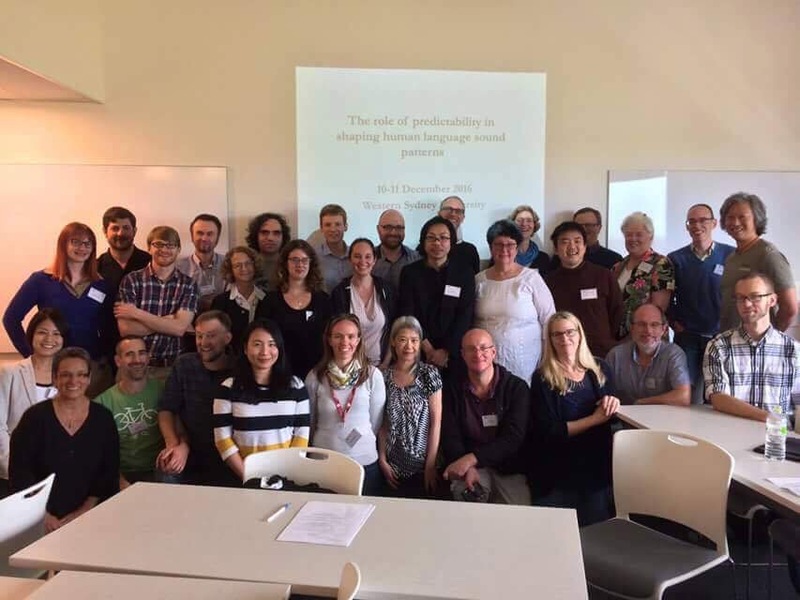 In addition to invited and contributed talks, the symposium will feature two workshops introducing corpora and computational tools for evaluating predictability in relation to phonological and phonetic patterns. The symposium will take place at the Parramatta South Campus of Western Sydney University in room EB.3.33. A map of the campus can be found here. For directions to Parramatta, click here. We recommend staying at or near the Novotel Sydney Parramatta. The Parramatta South Campus is a ~30 minute walk from the Novotel Sydney Parramatta. We have arranged shuttle transportation to and from the Parramatta South Campus before and after the symposium, as well as a walking group. Both ground transportation options will depart from the Novotel Sydney Parramatta on Saturday and Sunday mornings and return following the symposium. The walking group will leave the Novotel at 8:30 am on both Saturday and Sunday mornings. The shuttle will depart the Novotel at 8:45 am. The return shuttle will depart Parramatta South Campus at 5:30 pm. For those who wish to drive, parking on Parramatta South Campus requires a parking permit. Symposium attendees can request a free parking permit via email from Jan Willey or any of the symposium organisers. Permits sent by email need to be printed and displayed on the dashboard of the vehicle. Otherwise, parking permits are available for purchase ($9/day) from machines in the Parramatta South Campus parking lots. Registration for the two-day symposium is $100AUD and covers lunch, morning/afternoon teas, and return transportation to the Novotel. The symposium is free for AASTA members and students. Registration for the main SST conference is not required to attend the symposium. To register, click here. We are planning a symposium dinner for Saturday night, December 10th, at “El Phoenician”, a restaurant in the vicinity of the Novotel Sydney Parramatta. The cost of the dinner will be $35AUD ($20 for students) and should be paid at the time of registration. Any questions about the symposium can be addressed to the organizers, Beth Hume (beth.hume@canterbury.ac.nz), Jason Shaw (jason.shaw@yale.edu), Rachel Hendery (R.Hendery@westernsydney.edu.au), and Dominique Estival (D.Estival@westernsydney.edu.au).